I said when I started copying these over here that I had done a lot of them, but there were more than I realized! 3. Have you ever purchased a kit (with pre-cut fabric & pattern)? I don't think I have. I own one that my mother gave me; I'll get around to doing it one of these days. It would make a good baby quilt. 4. What is your least favorite color to work with? Plain muslin beige. 5. What is the weather like today where you are at? Good enough for quilting? Well, it is cold and rainy, so it would be a really good day to stay home and quilt, if I wasn't at work! 1. What is your favorite night to watch tv? I don't know if I have one - there isn't anything I am all that crazy about these days. 3. 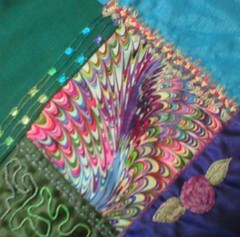 Do you own any wearable quilts? Nope. I'm chunky enough without any help. 5. In December's Edition of the Quilter's Home it mentions quilting tattoos. Do you tattoo? No. Fear of needles. 1. 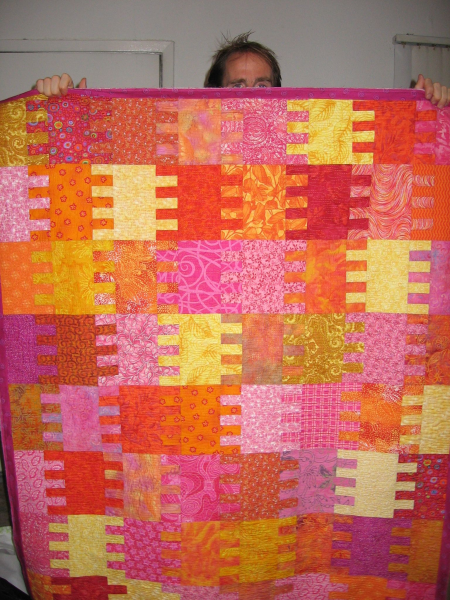 Do you stay up late to finish quilting --- late, like 1-2am? Not often - if I try to quilt when I'm tired I make mistakes. Like, really bad and/or stupid ones. It's not worth it. 2. What was/is your favorite quilting class? Hmm, I've enjoyed most of them. I seem to especially enjoy ones that aren't just about piecing - like Libbie Lehman's, and Melody Crust's, which is about coming up with your own quilting designs. 3. How many rotary cutting rules do you own? I can't possibly count because they're scattered all over the place, but at a guess I would say half a dozen. Possibly more. 4. Will you be watching the grammies Oscars this weekend? Always. Like somebody else said, my husband usually has control of the remote, but he loves movies and wouldn't dream of missing it. 5. What are your weekend plans? Buying a new (used) car! 'Cause my old one has gone to the great highway in the sky, or something like that. We have a loan pre-approved at the credit union and we are going shopping tomorrow. And Sunday I am taking a two-hour beading class. (And I also will have to make a trip over to my mother's house to oversee the extended family members who are going to be "cleaning up" over there. I don't trust them not to get carried away and throw away something that I want to keep!) I'm gonna be busy. 1. What is your favorite day of the week? Friday, I guess - for the usual reasons. Weekend coming up and all that. 2. What's your favorite kind of fabric? Batiks. We'll go with batiks. I like a lot of kinds of fabric, actually. 3. Can you believe it's March already? Definitely not. I suspect that February 2007 is going to be the Lost Month in my memory. 4. What do you collect (besides fabric)? Junk. 5. Quickest project time (and picture please)? I tend not to do very fast projects. 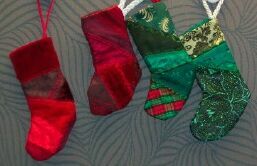 However, I guess this one qualifies: I decided to make crazy-quilted stockings for my co-workers a few years ago, and the seams are machine-embroidered. They were fast and they came out really cute. 1. What quilt/sewing project are you working on this week? I'm still in organizing mode. Also, I have a while to work on this, but I'm going to a retreat in late April and I need to start thinking about what I'm going to work on while there. 3. Do you believe in leprechauns? Um, no. I am generally something of a grinch about St. Patrick's Day, anyway. Particularly when people try to pinch me. 4. Have you been sick this winter? Yes. An awful lot. I had had a flu shot so instead I just had colds, one after the other.